"I had this drink in Tucson and talked the bartender into sharing the recipe with me." Pour salt into a small plate. 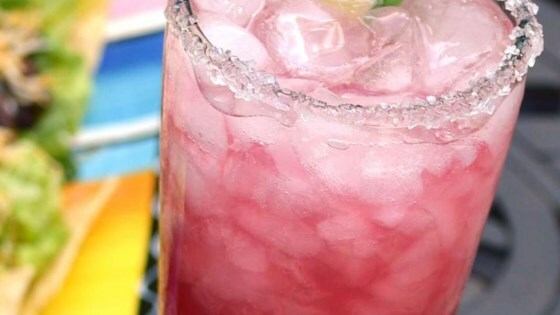 Wet the rim of a margarita glass and dip rim into salt. Fill a cocktail shaker with ice; pour tequila, sweet and sour mix, triple sec, lime juice, and pear syrup over ice. Cover shaker and shake drink; strain into prepared margarita glass. This is really good! Great job getting the secret! I also had this fabulous drink at the bar at the Tucson Airport and asked the bartender for this recipe. This is exactly correct except the bartender put a sugar rim vs. salt rim. Very tasty. I make my own sweet and sour mix using Splenda. Love the fuchsia color! Worth trying!